Truck drivers from Virginia and fictional British secret service agents don't have much in common—except for the way they avoid being identified by enemy agents paying tolls on the George Washington bridge. Besides being the best Bond movie ever made, Goldfinger famously featured a 1964 Aston Martin DB5. Among other ingenious gadgets featured on the Aston (two words: ejector seat) was a rotating license plate assembly. 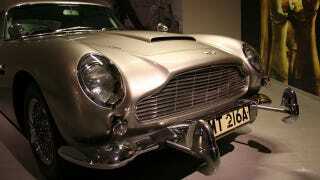 Where is James Bond’s Aston Martin DB5? We aren't sure if Nelson Vaquiz of Beaverdam, Va. got the idea to change license plates to fool the enemies (in this case the Port Authority of New York and New Jersey) from Goldfinger, but he was employing a similar tactic to Bond's when he was arrested this week. According to police Vaquiz had his front license plate rigged to a cable that flipped it to avoid detection while using a gateless toll lane on Interstate 95 without a transponder. In an attempt to avoid the $65 toll charged to five axle trucks while crossing the George Washington bridge Nelson Vaquiz had also bent up his rear license plate. Port Authority police saw the front plate device in action and tried to stop the Virginian truck driver. Vaquiz was eventually forced to stop and arrested for theft of service, possession of burglar tools and eluding arrest..
Q could not be reached for comment.